In other words, it should stop an acute reaction in its tracks. While many of us may have irritating allergic reactions to things like wool or cats, it can be a much different story for other people – for them, the anaphylactic shock that results from exposure to allergens such as peanuts or bee venom can result in hospitalization, or even death. Fortunately, scientists from the Stanford University School of Medicine and Switzerland’s University of Bern have recently made a discovery, that should stop severe allergic reactions within seconds. To begin, here’s what happens in a typical acute allergic reaction. The first time that a potential allergen enters the body, some people’s systems react by creating what are known as IgE (Immunoglobulin E) antibodies. 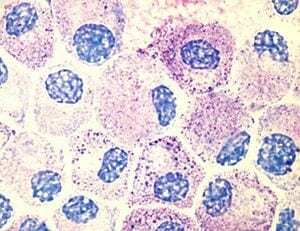 These antibodies remain in the body even after the allergen has cleared out, where most of them proceed to link with Fc receptor molecules, which are found on the outer surface of mast cells. When that same allergen is introduced to the body again, it binds with the antibodies clinging to the mast cells, causing those cells to release “inflammatory mediators” such as histamines – the result is a nasty allergic reaction.